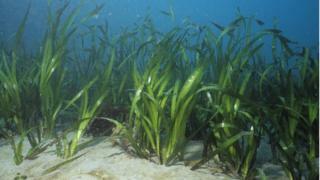 Most seagrass meadows around the coast of the British Isles are in a "perilous state", say scientists. Plants are being damaged by pollution and human disturbances such as mooring boats, according to researchers. Surveys of 11 sites in England, Wales and Ireland found high nitrogen levels in water were affecting the health of seagrass meadows at all but two areas. Seagrass, which is found in shallow waters of coastal regions, is declining globally at a rate of about 7% a year. In the 11 areas studied, even where conditions were good, seagrass faced damage from mooring or anchoring boats, said researchers Benjamin Jones and Richard Unsworth of Cardiff and Swansea universities. Seagrass meadows are regarded as a valuable habitat on British shores, particularly as a nursery ground for fish. The underwater plants face threats from human activities, including nutrient pollution, where nitrogen from agriculture and industry runs off land and enters the water. Dr Richard Unsworth of Swansea University said seagrasses were like the "canaries of the sea" in that their condition can be used as an indicator of the health of coastal waters. "We conducted the most extensive assessment to date of the environmental conditions of seagrasses in the British Isles, using techniques widely used to assess these important habitats in places such as the Great Barrier Reef," he told BBC News. "All the sites in our study were found to be at risk from either pollution, boating, or both, even those in relatively remote locations." He said the study showed action was needed to protect seagrasses in the British Isles. "We've historically lost at least 50% of these habitats in the British Isles, losing more should not be an option," Dr Unsworth added. Of the 11 sites monitored, the worst performing sites were three areas monitored in Wales and one of two sites in England, according to the research, published in the journal, Royal Society Open Science. However, two remote seagrass meadows around the Isles of Scilly and Mannin Bay off Connemara, Ireland - were relatively healthy. Writing in Royal Society Open Science, Mr Jones and Dr Unsworth said: "Our study provides the first strong quantitative evidence that seagrass meadows of the British Isles are mostly in poor condition in comparison with global averages, with tissue nitrogen levels 75% higher than global values." Many of the meadows sampled were "in a perilous state", they concluded. Dr Lyndsey Dodds, head of marine policy at WWF-UK, said seagrass is one of our most valuable ecosystems, helping to sustain the marine food chain. "It's vital that the status of our seagrass improves to deliver benefits for people and nature," she said. "WWF is calling on the UK Government to ensure seagrass is properly protected in effective Marine Protected Areas, where disturbance and pollution are minimised." Seagrass is a group of flowering plants that live in shallow sheltered areas along the UK coastline where they form dense green meadows under the sea. Because of where they grow they are vulnerable to damage from humans and are now a protected species. The main plant in the UK is known scientifically as eelgrass, Zostera marina. It is the most widespread marine flowering plant in the Northern Hemisphere, inhabiting the cooler ocean waters of the North Atlantic and North Pacific. It needs sunlight to grow, and is threatened by pollution and increased amounts of sediment in the water, which block sunlight and prevent seagrass growth. Seagrass beds are also affected by physical disturbances such as trampling, dredging, anchoring, and the use of mobile fishing gear on the sea bed. Researchers in Wales are calling on the public to report sightings and information about the location and condition of seagrass at Seagrass Spotter - Home.